Isn't it amazing how a scent can take you to a new place and instantly transform your mood? I love trying different scents, so I'm always switching things around. I'm the one who will buy my favorite product in four different scents, but I don't use them a full bottle a time. I switch them every few weeks, rotating between the scents. I am loving the Suave Essentials body wash line because they have some amazing scents. Keep reading to learn more about the different scents and get an easy sugar scrub recipe that I made with one of the body washes. Last week, I saw a quiz for Suave Essentials body washes. My results for the quiz weren't too surprising for me: Tropical Coconut. Yes, that would have been the first one that I grabbed! When I was at Walmart, I picked up the Suave Essentials Body Wash in Tropical Coconut. But of course, I couldn't stop at just one. As much as I love all things coconut, I know that fall is coming. I also grabbed Cocoa Butter & Shea, which smells like vanilla sugar, and Milk & Honey Splash because they are warmer scents for fall. I also Sweet Pea & Violet, which is more of a spring or summer scent to me, but I think I'll use it during the winter to remind me that warmer weather is ahead. Not sure which scent is right for you? Take the Suave Body Wash Quiz to see what scent you get! After you take the quiz, you'll get a cash back offer from Ibotta, too. 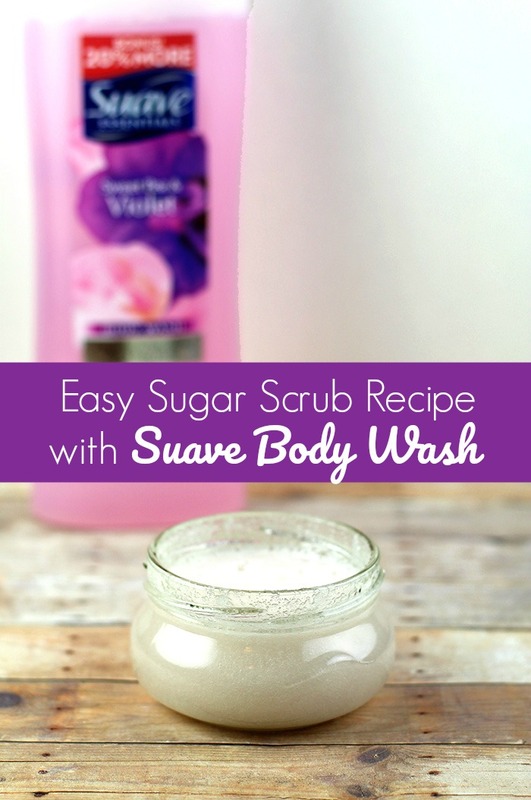 I love the smell of the body washes so much that I decided to use them in a sugar scrub recipe. This is great for your entire body, but I love it for my feet. Traditional sugar scrubs have oil in them, which isn't so great when you need to walk around after you scrub your feet. But this recipe exfoliates and softens without leaving your feet slippery. This recipe couldn't be simpler. In fact, there really isn't even a recipe. You can customize it for your preferences and eyeball the ingredients. I filled a small container about 3/4 of the way full with sugar. Then I almost filled it with Suave Essentials body wash and stirred it. I wanted my scrub thick, so I added some more sugar for a thick scrub. You can make yours thick or thin, depending on your needs. Now you have a wonderful scrub for your hands, feet, or body that's already scented and colored without buying anything extra. You can use the scrub and your body wash in the same scent to layer your scent for the day.